Drones were always intended for proactive people. The ones who want to have fun. Who wants to explore. Soar higher and fly further. The recent breakthroughs in radio and FPV areas are finally making these wishes a reality, pushing the limits of what can be achieved with each passing day. However, there will always be some limits. Here, we will explore just how far can a drone fly, take a look at some of the most outgoing crafts currently on the market and try to find out what is the best long distance drone money can buy. So for those in a hurry, here are the top 3 drones we would recommend to our friends, depending on their needs and budget. How to choose the best long distance drone? "Ideal For: Intermediate Pilots and casual Drone Racers"
Finally, we have a product from DJI's most famous and nimblest series. Sharing much of the same DNA as Mavic Pro and Mavic 2 Pro (the only difference between the latter mention and DJI Mavic 2 Zoom lies in the camera) the craft gives us a pretty good idea what we have here from the get-go – a fast, compact, lightweight and portable unit with very solid camera. The main gimmick through which Zoom earns its name is the 2x optical zoom lens which is the first of its kind on the drone market and a great way for DJI to stand out from the competition and diversify its portfolio even further. The design is great and true to DJI Mavic range, flying experience and control are excellent and build quality doesn’t lag too much behind. All in all, a flagship product aimed at casual consumers. When folded for storage Mavic 2 Zoom takes only 214 × 91 × 84mm and spreads to very compact 322 × 242 × 84 mm when unfolded. This small package weighs only 905g and in combination with substantial 3850mAh produces excellent flight time of 29 minutes (31 minutes if flying at the constant speed of 25km/h). However, the main treat this small drone brings to the table is excellent flight distance of 18km which makes it the most outgoing flyer on the list by a landslide. The speed is not bad either. You will be able to reach your destination at 72km/h. Mavic 2 Zoom’s camera somehow manages to be among its strongest selling points and at the same time one of its biggest drawbacks. Don’t get us wrong – the camera itself isn’t bad. You get your standard 12MP 1/2.3" CMOS sensor capable of producing very quality output in a wide variety of different formats. And you do get optical zoom which can come in handy in tons of situations. 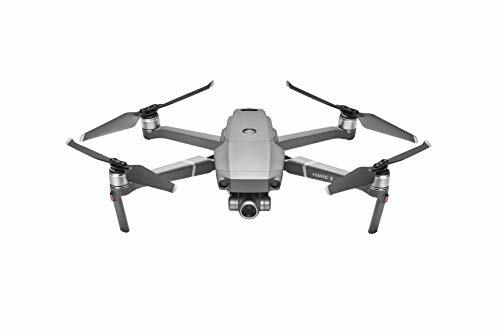 On the other hand, Mavic 2 Pro that shares the same specs features an even better 20MP camera that offers stronger image quality and improved frame rate, but doesn’t have optical zoom. So it's really apples and oranges. If you need to fly at great heights and don’t lose any of the image quality while tracking action below, Zoom should be the obvious choice. Mavic 2 Pro is definitely aimed more users looking to shoot professional video, especially in low light conditions. We cover the differences in more detail in our drones for sale buyers guide. As you would expect from a Mavic, Zoom packs very strong obstacle avoidance capabilities coupled with a set of very interesting shooting features, some of which are pretty unique. For instance, Dolly Zoom can create a very cinematic change in perspective by zooming at the target at the same pace as the drone flies away, a benefit of the optical zoom capabilities. Another great mode is Hyperlapse which creates automated time-lapse images by shooting a series of RAW images alongside the set path in preset time intervals. Truly impressive. "Ideal For: Beginners and Intermediate Pilots." The product that comes from DJI Phantom 3/4 range always manage to bring quality on the table and Phantom 4 Pro is truly no exception. More robust and streamlined than it’s cousins from the DJI Mavic range Phantom 4 is a heavy-duty performer that sits at the very top of the high-end drone market segment regardless of the topic we discuss. The collision detection is flawless, controls tight and easy to handle and the flight experience is one of the best, if not THE smoothest you can find on the market. Landing gear may pose a problem for backpackers and compromise the visual appeal of this already bland-looking unit, but, the Phantom series has always been about the performance and if this inclusion will prevent the craft from crash-landing who are we to complain. One of the rare flaws we can think about the unit is the lack of touchscreen-powered controller (you have to use your own phone for this purpose). Upgrading your existing controller will cost you whole $300, which is the price you pay for a medium sized drone! Phantom 4 may not be the smallest or the lightest drone on the market, but it is a perfectly balanced one. The weight of reasonable 1388g doesn’t put too much pressure on the powerful 6000mAh battery and produces excellent 30 minutes of flight time. The speed isn’t shabby either – you can push the drone 72km/h. The maximum flight distance sounds even better – in ideal conditions Phantom 4 Pro can fly as far as 7 kilometers from your current position - the very top of the offer. If Phantom 4 Pro stands near the top of the long distance quadcopter bunch it is easily the best shooter amongst them. This time, the camera is bumped up to 20MP and you can finally shoot 4K videos in 60 frames per second. Going down the resolution ladder (720p) will unlock the possibility of shooting super slow motion videos at 120fps. The image quality is excellent, and you get all the output formats you can image (including RAW). This amazing package is rounded with a solid 3-axis gimbal that will keep the captured material smooth and clear. True to the brand name it carries, Phantom 4 is stacked with interesting features you get to play with. Some of the most interesting mentions are Tripod mode (the drone locks out the joystick controls and uses GPS and sensors to hover in place), great obstacle avoidance, and Portrait mode that locks and follows the target matching its pace and height. "Ideal For: Experts and Commercial Users"
Calling this craft Inspire 2 doesn’t do it any real service. The T650A mark that is reminiscent of something you could hear in the Terminator movie series suits it much better. And truly this drone looks more like something produced by Skynet than an expensive gadget. The super polished magnesium aluminum composite shell of the drone looks and feels simply superb, and the strong black carbon fiber arms that are attached to it enhance the menacing insect-like visual style of the craft even more. Another good news is that the crafts remote signal frequency can be switched between 2.4GHz and 5.8GHz, which has its effect on the quality of the connection. It should be clear by now that we are talking about a premium product that features a bunch of interesting options but might be for everyone’s pocket. All the goods we covered above make Inspire 2 make one of the heaviest long range drones on the market. The total weight of the craft with mounted camera amounts to quite substantial 3440g, which takes its toll on the flight time, but not too heavy. The built-in 6000mAh battery is able to keep Inspire 2 in the air for average 23-27 minutes. However, the maximum take-off weight of the craft is 4250g so you will at least get an opportunity to play with different camera options. However, the DJI 3512 motor setup is powerful enough to fly the craft 7km away from you at astonishing 94km/h so your time in the air will be well spent. As for the size, Inspire 2 falls right in the middle of the similar products we can see on the market. The dimensions of 427 x 317 x 425mm are certainly compact enough for seamless transport. However, having a strong protective case is highly advised. The powerful Zenmuse X5S camera that can be found in a package was designed specifically for this model ramps up the resolution to 20MP and allows you to shoot your videos in 5.2K, albeit at 30fps (4K goes all the way up to 60fps). The captured material still looks seamless, so who are we to complain. As you would expect, you get a bunch of shooting modes (burst shots, single shot), a variety of frame rates and several different output formats. The extensive sensor support that allows the craft to notice the objects in range of 30 meters and precise GPS location, allow a bunch of impressive automated shooting modes like TapFly, ActiveTrack, WayPoint and Point of Interest. What’s most important is that the captured material is excellent (both images and video), so you’ll definitely get the worth for your money in this department. Inspire 2 is one incredibly nimble and fast piece of hardware equipped with all the neat features you would expect from DJI, so all the regular mentions like RTH and quality feature-rich app are there and work like a charm. Still, we will give a special shout-out to Dual Control carried over from Inspire 1. Namely, if you have a friend who is interested in shooting and you are willing to invest into an additional controller, you can have fun flying the craft and let your friend move the camera independently. An interesting and unique feature that definitely introduces a welcome change of pace to the drone market. "Ideal For: Those Shopping on a Budget"
There are a lot of good drone manufacturers currently in the business. However, one would have to be completely oblivious to deny that DJI towers very high above everyone else. 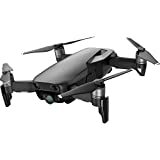 There is no better proof to this claim than the fact that DJI Mavic Air, one of the best commercially available long distance drones easily registers for under $1000. A premium product coming at an entry-level price. The craft is bringing one very tough fight into Yuneec’s backyard. What’s even worse for the competition, this small beast has it all – the speed, the distance, the camera, you name it. Throw into equation lightweight and portable design and you will get one incredibly appealing product. As we already mentioned, one of Mavic Pro’s standout features is definitely its portability. When folded for transport the unit takes no more than 168×83×49mm and weighs mere 430g. Even when fully unpacked, these measures are more than modest. Build quality is all but and goes off the charts, with the slight exception of the cover back that is needlessly hard to put back on after use. The unit features a very solid 2970mAh that, combined with light weight, produces adequate 20 minutes of flight time at a speed that goes up to 68km/h. If you keep the craft at the optimal 25km/h speed you may squeeze additional minute in the air, but it’s really no worth bothering.. However, the most astonishing thing about this small bullet is the amazing control distance of the whole 10 kilometers. DJI Mavic Air features the camera that falls in line with the rest of the 4K long distance bunch, but that doesn’t have to be a bad thing. On the contrary, the 12-megapixel camera setup we can find in the craft can stand toe to toe with the one that adorns the much bulkier Phantom 4.You even get a very compact 3-axis gimbal to keep the lens steady while flying. A solid software that allows object tracking, image recognition and hand gestures will provide a bunch of pleasant shooting sessions. Keep the drone in the air during daylight, though, because low light output is pretty average. The only major downside we can think of are the very touching camera controls. This problem, though, can be addressed by switching to Cinematic mode that will slow down the craft and smooth out the camera movements. Mavic Air is one very feature-rich beast and the shooting capabilities we covered above are just the tip of the iceberg. The drone also features several intelligent auto-flight modes that are capable of avoiding obstacles along the way. Keep in mind, though, that the craft doesn’t feature any sensors on the top and the sides, so there still might be a couple of close calls if you too heavily rely on the drone’s autonomy. Shooting the footage is fun, and allows you a lot of options. You even get an opportunity to capture HDR stills. As for the self-guided modes, they are pretty extensive, and include the likes of Asteroid, Boomerang (they both follow a certain path and capture short videos with the focused objects), ActiveTrack that is able of simultaneously tracking up to 16 subjects at the time, and so on. "Ideal For: Beginners! 6 rotors makes it super stable"
Yuneec is a manufacturer that has gained quite a respect for pushing a series of high-quality drones coming with a very affordable price tag. They are also the sole reason why this list isn’t a DJI private party, which is no small achievement. But there will be more than enough time to talk about long distance DJI drone range later. Where does ambitiously named Typhoon stand in the hierarchy of long-range flyers based on its merits? We are glad to say – definitely in the upper tier. So far, so good. Let’s take a closer look on the specs. Although not amongst the smallest units on the market it is very hard to call Typhoon H anything other than compatible. The sleek but somewhat fragile body measures 520 x 456 x 296mm with the diagonal wheelbase of 480mm. The substantial battery packs 5400mAh which brings us to the total weight of 1965g, which makes one pretty balanced package. The craft is brought to the air by six powerful motors which is both a blessing and a curse. On the one hand, the flight stability and the level of control you get over the craft are way beyond its price point. On the other, high power draw bogs down the flight time to only 22 minutes. However, you are still able to breeze at the very high speed of 70km/h, covering the range of 1.6km around you and keep flying even if one of the motors which is sown which is more than enough to earn Typhoon a spot on this list. Typhoon H is a very capable shooter. Featuring a rotating 4K 12-megapixel camera (it goes all 360 degrees), quality lens, 3-axis gimbal, and affordable price tag, this package makes one incredibly easy purchase. The shooting frame rate at UHD may be locked at 30fps, but drop the resolution to 1080p and you will be able to make some astonishing slow-motion videos at 120fps. The quality of still photos may not be amongst the best on the market, but it’s still way above average. Unlike other options with a similar price tag, Typhoon H features a very tight controller with built-in 7-inch Android display which is a real blessing since you will be able to use your phone while flying. The craft supports GPS navigation, offers RTH failsafe, and features eight intuitive flights modes suited both for beginners and professionals. Another feature worth mentioning is Curve Cable Cam which allows you to set the drone fly between predetermined coordinates while giving you free rein over the camera. Although all the drones you can find on the market operate on the same logic and usually scale all of their specs equally as you climb up the price ladder (e.g. longer flight range usually goes packed with better camera), the long distance drones still have their unique set of specs you should pay attention to while choosing. So, here are the things you should consider if your priority is to explore new frontiers. The 4K camera drones are built for image quality. The racing drones are, obviously, built for speed. Although it can feature both these qualities a regular long range quadcopter is built primarily for efficiency. This means powerful radio communication equipment operating on longer wavelength, lighter build, large-capacity battery, lower RPM motors and a set of pretty substantial propellers. It is also worth mentioning that these units are usually not as customizable as their brethren, so what you buy is what you get. So, we established that frame long-range drones need to have light and economical frames. How that translates to numbers? Well, surprisingly enough, lighter and smaller doesn’t necessarily translate to better. If you want to achieve the best results, you should aim for 7-inch (178mm) frames with wheelbase ranging between 220mm – 300mm. They are able to carry some very chunky batteries while still being very efficient and able to cruise without any hiccups. When it comes to long ranges, having a craft that can stay in the air for extended periods of time is absolutely necessary. No matter how fast you fly, your drone will need some time to fly to a remote location and get back home. Any kind of seamless long-distance expedition will require at least 20 minutes of airtime. Keep in mind that we purposefully pointed out the flight time rather than battery capacity. The more powerful battery often translates to longer flight time, but not always. It really depends on the drone’s efficiency. Still, you can take a 5000mAh capacity as a reference point to where your intended craft stands. The capacities bellow will rarely produce solid flight times. The radio transmission equipment is important for more than one reason. First, a strong radio signal allows you to control the craft on longer distances. Second, stable connection is absolutely necessary if you are going to use FPV capabilities because any kind of lag can disrupt your navigation and cause your craft to crash. Typical multipurpose cheaper drones operate on the high-frequency radio waves on the 2.4GHz spectrum. Since larger-sized waves are able to penetrate solid objects and travel greater distances without interference, lowering the frequency to 1.2 GHz should extend your control range to 10km or more. Another way to deal with signal interference and enable stable video link is to buy a unit that features dual (2.4 GHz and 5.8 GHz) frequency bands. Any kind of long-distance craft can't be imagined without GPS/GLONASS support. Otherwise, you would be restricted to your FPV link to position your craft in the world, which is nearly impossible during long-range flights. However, this is only the beginning. The drones are pretty expensive gadgets and long flights tend to be quite treacherous. You should take as many precautionary measures as possible. That is why you should try to find a unit that is able to automatically find its way home while avoiding obstacles, and safely land to the ground in the case of lost connection or low battery. All of the aforementioned entries produce a property that is called transmission range, or, in other words, the max distance on which you are able to maintain the connection between the controller and the craft. Currently, some of the strongest units on the market are able to fly as long as 18km. Once again, you should take these numbers with a grain of salt and be aware that they can vary for a number of different reasons (e.g. weather conditions, signal interference, etc.). That is why you shouldn’t really try to squeeze every single meter of distance out of your craft. In the case that happens whether purposely or accidentally (e.g. controller malfunction) be sure to have an RTH option turned on as a fail-safe. And now that we’ve covered the theoretical groundwork, let’s see what the best flyers on the market are and which craft can fly the furthest. FPV stands for First Point View. This useful feature allows you to navigate your craft by sending the downlink from the camera to your controller or smartphone. This way, you see what drone sees and get the so-called “first point” perspective. Note that flying in FPV mode can be very tricky at long distances so it's best to use GPS and other assistance to help you with navigation. Q: How to prevent the drone from flying out of the range? The drone can fly off the range for a number of different reasons, some of which may be intentional some accidental. For instance, if you set your drone to fly in a straight line, it will, at some point, fly out of the control range. The bigger problems are unintentional fly-outs caused by a lost connection between the controller and the craft or faulty GPS. In such circumstances there is very little you can do to fly the craft back to safety. The only option is to turn on the RTH (Return to Home) failsafe feature that will safely fly your drone to the take-off point in the cases of emergency. Q: Can I transport objects over long distances using a drone? Yes, but most of the commercially available drones aren’t capable of lifting heavy objects. If you want to transport some items or use heavy professional cameras for shooting, you should take a look at some of the models built specifically for this purpose. For instance, DJI’s latest addition to Matrice lineup M600 can carry up to 6kg of mounted weight and fly solid 5km away from your position. Q: What if I face battery discharge during flight? Most of the modern will prevent this situation from occurring. When the battery comes too close to 0% the craft will automatically switch to RTH mode or simply land itself back to ground in the current position. However, you should do your best not to push your craft to the limit because both these failsafe mechanisms can be disrupted for a number of different reasons. So, keep a close eye on the battery status on your display. Q: Can I switch a camera on the drone for a GoPro? Some crafts will allow you this option while others feature built-in cameras that can't be replaced. Since cameras make a substantial chunk of drones’ price, if you want to use your trusted GoPro, it is best to buy the unit with a camera mount that sells camera separately and save some money in the process. We hope you enjoyed this roundup of some of the best commercially available long distance drones that can currently be found on the market. Tell us what you think, share the post with your friends and tell us how far have you managed to fly your craft of choice.